About AccountSight: AccountSight is a user friendly and efficient online time and expense tracking and billing software. It is a cloud based application highly effective for freelancers, contractors, independent consultants and small businesses to maintain weekly timesheets and project billing as well as for mid-size organizations that require online project management, employee time and expense tracking and invoicing capabilities. The hassle free user experience and rich functionalities make AccountSight a unique choice for users. The PayPal integration process allows users to receive payments from their customers online. The PayPal integration pages explain how users can configure their PayPal account setting in AccountSight and how their customers can instantly and safely transfer money to their PayPal account through the PayPal link on the invoice. Fast and secure payment of invoice payments. Direct transfer of money to the user’s account instead of cash or check delivery. Helps to keep the cash flow under control by having timely payment of project invoices. PayPal Integration Overview: Managing payments of project bills is very important from a company’s business perspective. AccountSight’s PayPal integration functionality simplifies and accelerates the payment process from the customers’ end. 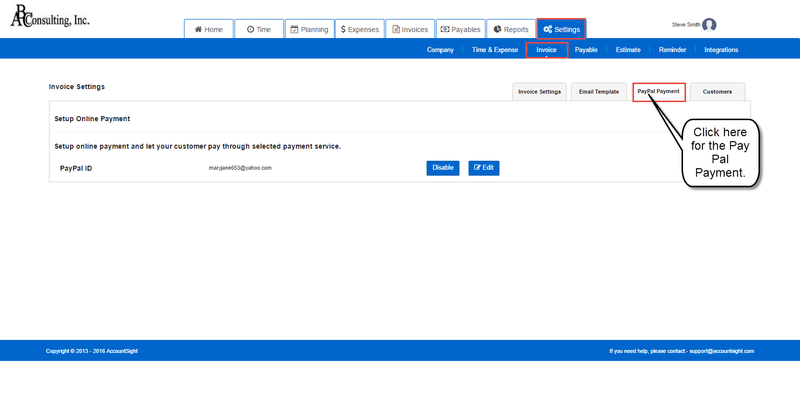 Only the Admin can enable and initiate the PayPal integration feature for fast and safe online payment.